From looking beyond numbers in order to measure diversity to learning from different cultures, these top partners share their insight on ways for a firm to become truly diverse. 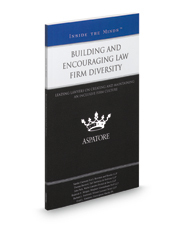 Additionally, these experts discuss the challenges of finding and recruiting diverse attorneys and how outreach programs for the next generation can benefit both law firms and the communities they serve. The different niches represented and the breadth of perspectives presented enable readers to get inside some of the great legal minds of today, as these top attorneys offer their opinions and expertise on this increasingly important topic.